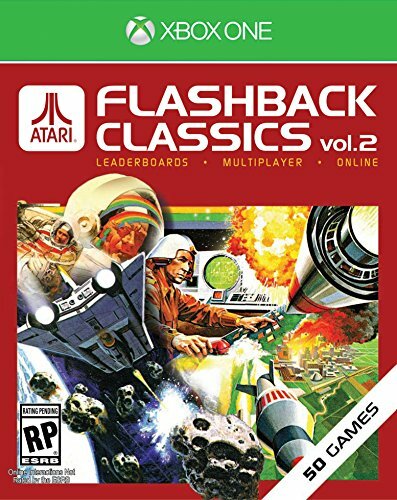 Atari Flashback Classics Volumes 1 & 2 - Xbox One Review — GamingWithSwag.com - Dads By Day, Gamers By Night. High Level Premise: 100 classic Atari VCS and arcade games split between two collections. Graphics/Style: The classic blocky retro graphics you love, with official marquee headers, box art, and official art used for backgrounds. Music/Soundtrack: Generic upbeat music for the menus, all other sounds are authentic to each title and emulated near perfectly. Story: Atari made a lot of games, now you can play 100 of them! Replay-ability: Very High, many Atari games like Tempest and Warlords are always easy to come back to over and over again. Time Commitment: Minutes or hours, depending on if you get sucked into competing for leaderboard scores or playing online. Value: It's two 50 game collections for $19.99 each. However you can get all 100 games on Steam for the same price. Favorite Element: Being able to play arcade classics like Tempest and Centipede and not waste hundreds of quarters like I did back in the 1980s. It's no secret that I am a huge fan of Atari, it was the system I grew up with as a child. I have over 200 unique Atari VCS cartridges in my video game collection, and some of the best video game memories I have is playing Atari with my father when I was younger. Over the years these games have been repackaged in various formats for systems like PlayStation, Dreamcast, and even the ill-fated Nokia N-Gage. There was even a team-up between some highly respected members of the Atari community and AT Games to create a Plug-and-Play system with accurate emulation, and the ability to play with authentic controllers. There was even a model that could have been modified with a cartridge slot. Earlier this March, the developer Code Mystics released a package of Atari games on Steam titled the Atari Vault. Reasonably priced at $19.99, it includes 100 games along with 3-D box and arcade art and scans of manuals. Players are able to find matches of multiplayer games on-line, and compete for high scores across global leaderboards. Overall it's an excellent package at a great value. 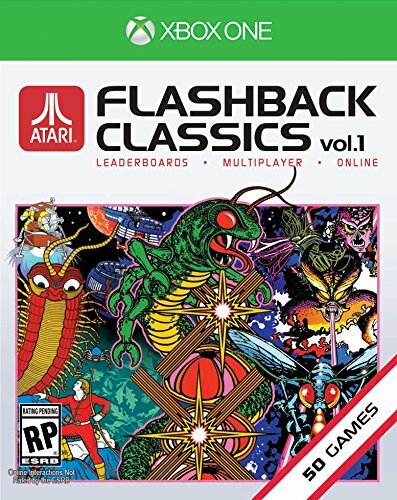 Atari Flashback Classics Volumes 1 & 2 retains all of this, but for some reason splits the package into two separate titles. 9 Arcade games: Black Widow, Centipede, Liberator, Lunar Lander, Millipede, Pong, Space Duel, Tempest, and Warlords. 41 Atari 2600 games: 3-D Tic-Tac-Toe,, Air-Sea Battle,, Backgammon, Basketball, Blackjack, Bowling, Canyon Bomber, Centipede, Circus Atari, Combat, Combat 2, Desert Falcon, Dodge 'Em, Fatal Run, Football, Home Run, Human Cannonball, Millipede, Miniature Golf, Pong Sports, Quadrun, Radar Lock, Realsports Boxing, Realsports Football, Realsports Soccer, Realsports Volleyball, Save Mary, Slot Machine, Slot Racers, Sprint Master, Star Raiders, Steeplechase, Stunt Cycle, Super Baseball, Super Football, Swordquest: Earthworld, Swordquest: Fireworld, Swordquest: Waterworld, Tempest, Warlords, and Yars' Revenge. 9 Arcade games: Asteroids, Asteroids Deluxe, Crystal Castles, Gravitar, Major Havoc, Missile Command, Red Baron, Sprint 2, and Super Breakout. 41 Atari 2600 games: A Game of Concentration, Adventure, Asteroids, Atari Video Cube, Basic Math, Brain Games, Breakout, Casino, Championship Soccer, Code Breaker, Crystal Castles, Demons to Diamonds, Double Dunk, Flag Capture, Golf, Gravitar, Hangman, Haunted House, Maze Craze, Missile Command, Night Driver, Off the Wall, Outlaw, Race, Realsports Baseball, Realsports Basketball, Realsports Tennis, Return to Haunted House, Secret Quest, Sentinel, Sky Diver, Spacewar, Starship, Stellar Track, Street Racer, Submarine Commander, Super Breakout, Surround, Video Checkers, Video Chess, and Video Pinball. This is my main complaint with these releases, as there is ultimately no reason why this should be two separate titles. Most Atari game files (also known as roms) are no more than a couple of kilobytes of storage. Even with artwork, and online play, the full downloads only take up 401 MB and 413 MB respectively. That's well under 1 Gigabyte of storage which is nothing today, a standard Blu-Ray disc can hold about 25 Gigabytes of storage. From a technical standpoint, there is no reason both of these collections could have been placed on a single disc. the other major issue I have is convenience. It's very accessible to have all 100 titles at your fingertips in the Atari Vault application, where as if I am playing Tempest on Volume 1, but I decide to want to play Adventure, I have to quit out of the game, and load up the second volume. This is even more frustrating if you have the physical disc releases of the games, a lot of disc swapping could potentially be in your future. Emulation is authentic, and has beautiful backgrounds with original artwork. Each collection retails for $19.99, which seems like a slap in the face to console users. $39.98 for two digital files that are more inconvenient than a digital PC release seems unfair and more like an intentional money grab. However, it is the only way to play these classic Atari titles on a console, and the emulation is still solid. Each title plays exactly like it should, with accurate sound effects and graphical glitches just like they were back in the 1970s and 80s. I highly recommend you grab the Atari Vault on Steam over these two releases if you have a chance, they are made by the same company, have very little differences, and is a overall better deal.